Whenever it’s that lull after the holidays, I feel an ever-growing need to stay in and cook more – perhaps it’s too much effort to walk out in the cold to eat or maybe I just want something home cooked after eating greasy foods to save myself after a debaucherous New Year’s Eve. When I do make brunch at home, I am going for healthy and tasty. So this is my interpretation of a somewhat healthy/tasty chilaquiles recipe. I had leftover ingredients from enchiladas I made a few days before so I thought why not make a brunch version of an enchilada with my favorite part of the enchiladas…the red sauce! I also think that you can make it with or without the soy chorizo and can sub it for black beans. I just happened to have some soy chorizo on hand so why not use it?! I was quite happy with the textures and flavors of the chilaquiles. I like to use a wider stainless steel pan with a decent amount of surface area to make this brunch specialty. And they yield delicious leftovers for brunch the next day! Delicious and quick vegetarian chilaquiles recipe for a lovely Sunday brunch! Preheat the oven to 400 degrees. Spray two large baking sheets with cooking spray. Split the corn tortillas into 4 stacks of 4 (depending on how many you have) and cut each tortilla into 8 wedge slices. Put the tortilla on the baking sheets and spread them out as much as possible. You ideally want them in a single layer, but there might be some overlap if you don’t have enough space and that’s okay. Break your eggs in a small bowl with turmeric and almond milk. Mix everything together. Brush the tortillas with some olive oil – enough to brush each slice, but you don’t want them drowning in the oil. Bake in the oven for about 12-15 minutes till they are crunchy/golden. While the tortillas are in the oven, chop and dice your onion, garlic, cilantro, radishes, and green onion. Heat up a medium-sized frying pan on medium heat, add some grapeseed oil. When the oil is warm enough, add the soy chorizo. Sauté the soy chorizo for a few minutes on each side until it’s golden brown. In a large frying pan, heat the olive oil on medium heat, when the oil is warm, add the onions and sauté them for about 4 minutes till they are slightly golden. Then add the garlic and pan fry for about another minute on medium low heat. Add the soy chorizo and the tortilla wedges, and stir for 1-2 minutes. Add the salt, pepper, red pepper, chili powder, cayenne pepper, paprika, and cumin to the pan and make sure that everything is stirred well and evenly coated in the spices. Sauté for 1-2 minutes, turn down the heat to low and then add the sauce and egg mixture. Constantly stir the egg mixture so it is creamy and doesn’t cook too fast. When the egg mixture has set in and everything is mixed together, sprinkle the cheese on top and immediately turn off the heat. Add the cilantro, green onions, and radishes for your garnish. Enjoy your hearty and delicious brunch! I like to add a few slices of refreshing avocado – which is optional. Soy chorizo is already pretty well-seasoned and you will be seasoning the chilaquiles so all you need to do is pan fry them so they get a nice, crispy texture. When they are crispy, set aside and they will chill while you’re cooking the vegetables. Split the corn tortillas into 4 stacks of 4 (depending on how many you have) and cut each tortilla into 8 wedge slices. Put the tortilla on the baking sheets and spread them out as much as possible. You ideally want them in a single layer, but there might be some overlap if you don’t have enough space and that’s okay. Brush the tortillas with some olive oil – enough to brush each slice, but you don’t want them drowning in the oil. Bake in the oven for about 12-15 minutes till they are crunchy/golden. 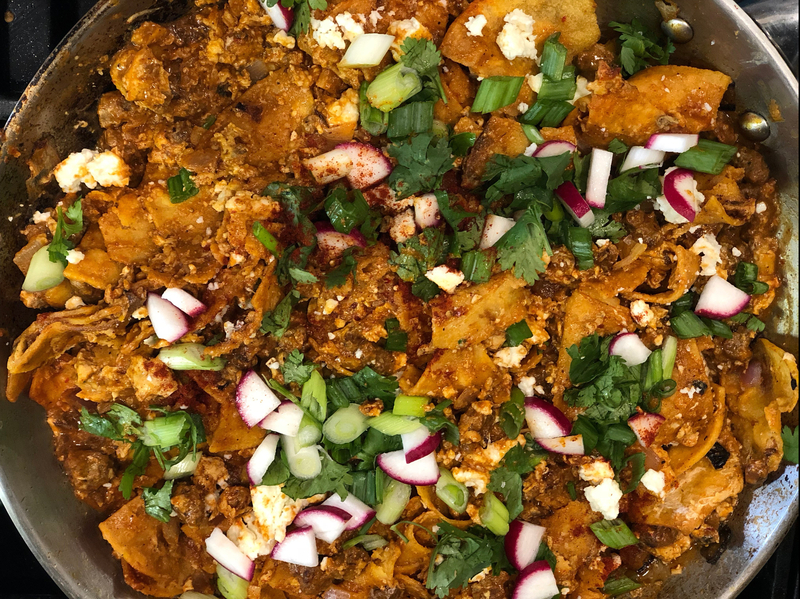 While the tortillas are hanging out/cooling off, you can continue to cook your chilaquiles masterpiece. Heat up a medium-sized frying pan on medium heat, add some grapeseed oil. When the oil is warm enough, add the soy chorizo. Sauté the soy chorizo for a few minutes on each side until it’s golden brown. Soy chorizo is already pretty well-seasoned and you will be seasoning the chilaquiles so all you need to do is pan fry them so they get a nice, crispy texture. When they are crispy, set aside and they will chill while you’re cooking the vegetables. In a large frying pan, heat the olive oil on medium heat, when the oil is warm, add the onions and sauté them for about 4 minutes till they are slightly golden. Then add the garlic and pan fry for about another minute on medium low heat. Add the soy chorizo and the tortilla wedges, and stir for 1-2 minutes. Add the salt, pepper, red pepper, chili powder, cayenne pepper, paprika, and cumin to the pan and make sure that everything is stirred well and evenly coated in the spices. Sauté for 1-2 minutes, turn down the heat to low and then add the egg mixture. Constantly stir the egg mixture so it is creamy and doesn’t cook too fast. When the egg mixture has set in (meaning that it’s okay to eat them now) and everything is mixed together, sprinkle the cheese on top and immediately turn off the heat. Add the cilantro, green onions, and radishes for your garnish. Just made this with cotija and it was sooo good!